Posted 12/20/2018 6:00pm by Ryan Lacz & Liz Balchin. Last minute stocking stuffers: tanned sheep fleeces! We recently got a beautiful batch back from the tannery, just in time for the Holiday! 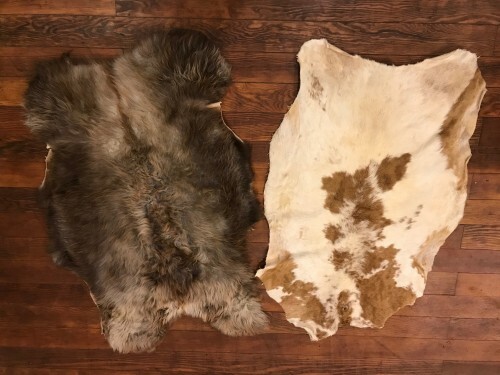 In an effort to utilize the whole animal, we send out the hides from our sheep to a tannery in Pennsylvania- it takes them 4-6 months to tan, clean and brush the fleeces, but the results are well worth the wait. We do have a few from our neighbor's Icelandic Sheep flock (left side of the photo)- a special breed that produces beautiful colored and premium quality wool. 3-4" long wool, incredibly soft. We usually sell out within a few days, so they really are first come, first served. I've set up a new department in our store, with pictures and measurements. We can also email you pictures and prices. Pickup at the farm, or at the indoor Stroudsburg, PA farmers market this Saturday, or we can hold onto them for you for pickup at one of our other drop sites later in January. We can mail them as well, though shipping is separate & not included in the online price.